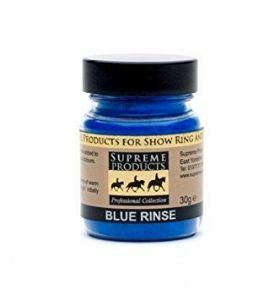 From the Professional Collection Supreme Product's Blue Rinse is used to enhance the colour of white, grey, black, brown and coloured coats, this product can be used when shampooing is not necessary or as a final rinse. Use very sparingly - only ¼ to ½ a level teaspoon in a 2 gallon bucket of warm water should be adequate. Test on hairs first but this professional product comes highly recommended. Supplied in a 30g bottle.